These activities through the years in commerce, transport, defence and leisure have all contributed to the growing importance of this area and are documented in Helensburgh Heritage Trust’s excellent book '200 Years of Helensburgh'. 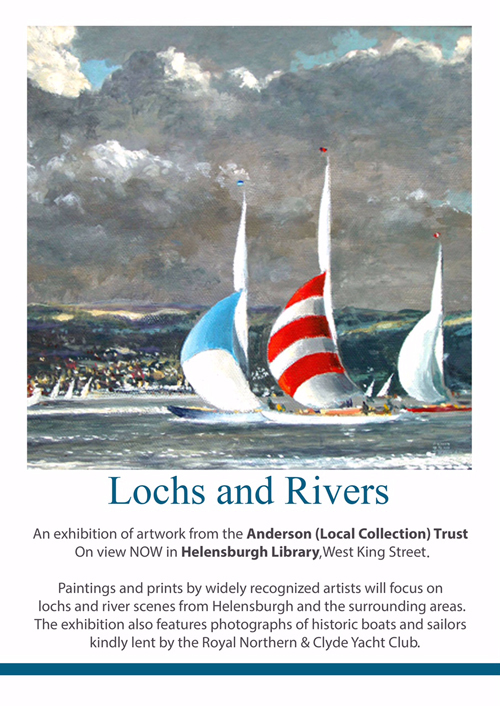 They are also well illustrated in the current exhibition of paintings on a maritime theme from the Anderson (Local Collection) Trust, ranging in subject from Colin Hunter’s moody etching of “Fishing Boats” on the west coast, to Robert Barbour’s depiction of a Trident submarine setting out from Faslane against a characteristically turbulent sky. The time when these works were painted covers a period of more than 150 years, during which Helensburgh became an inspiring place for artists to live and gather to paint. Represented in this exhibition are well-known artists such as Sir William Russell Flint, William Leighton Leitch, and 'Glasgow Boys' James and Alexander Nisbet Paterson and James Whitelaw Hamilton. The most recent addition to the collection, 'Gareloch' by Hugh Cameron Wilson, is of particular topographical interest, depicting Faslane as it was in 1945 before the construction of the nuclear submarine base and inviting comparison with the present view. ArthurTurner’s 'Clyde Regatta' illustrates another aspect of the maritime theme — leisure and competitive sailing, which is well supported by the photographic display in the glass case. The Anderson Trust is grateful for the co-operation of the Royal Northern and Clyde Yacht Club in lending photographs of historic yachts and sailors associated with this club. Both the RNCYC, which can trace its origins to 1824, and Helensburgh Sailing Club have attracted sailors far and wide and nurtured some fine yachtsmen and women whose achievements have gained them international recognition, such as Charlotte Dobson, who competed in the Summer Olympics of 2014, Mike McIntyre MBE, whose team won a sailing gold in the 1988 Seoul Olympics, and the round-the-world sailor, Emma Richards MBE. Also included in this display are photographs of Nance Anderson, to whom the Trust owes its origins and who was herself a keen and accomplished yachtswoman. The exhibition will be open until June. The top pictures are 'The Paddle Steamer Lucy Ashton' by R.H.Wylie, 'Trident' by Robert Barbour, and 'The CTS Empress'.